After seeing how his closest followers achieved important victories in the other boards, Magnus Carlsen was able to convert his advantage into a win in the tenth round of the Candidates Tournament. 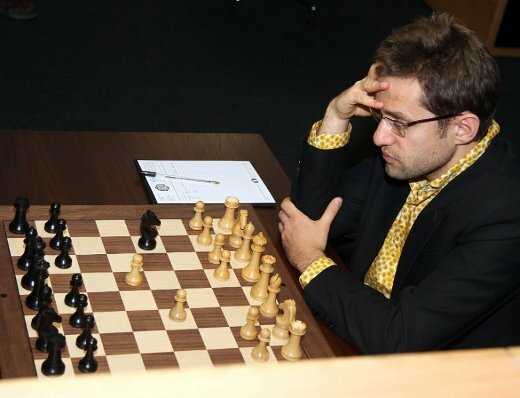 Vladimir Kramnik defeated his compatriot Alexander Grischuk in what appeared to be a totally equal position, while Levon Aronian took advantage of Ivanchuk’s time trouble crisis to win his fourth game in this event. Boris Gelfand chose the fashionable Rossolimo variation of the Sicilian Defense to face Magnus Carlsen’s 1.e4. True to his style, the Norwegian made some simplifications in order to create a positional battle. Carlsen won a pawn during the complications, but remained with a passive bishop on f1. The position before the time control seemed dynamically balanced, but the best rated player in the world had a long-term edge that allowed him to put pressure on his opponent. The Israeli, hurried to exchange some pieces and go into an endgame, went astray with Ra1. Carlsen obtained a coupe of strong connected passed pawns on the queenside, which would become the decisive factor of the game. Gelfand had no way to stop the promotion of the b-pawn, so decided to resign on move 48. 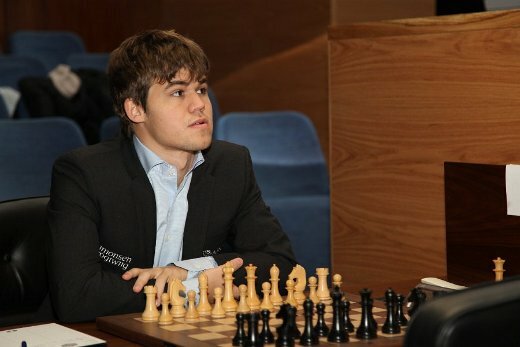 Carlsen is now on +4 with four rounds to go. Ex-world champion Vladimir Kramnik used the Defense that gave him the biggest honor in the chess world 13 years ago. He put up a Berlin Wall against Alexander Grischuk, just as he did in his London match against Garry Kasparov. This time, he did not only achieve a comfortable draw, but instead managed to win and stay in the race for first place. 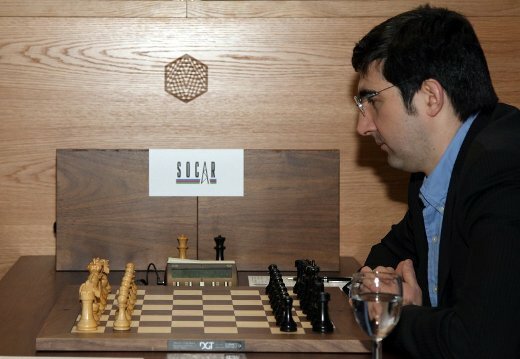 Kramnik looked for ways to equalize as fast as possible in his favorite Berlin. Grischuk, who knows as good as anybody the strength of his opponent, agreed to simplify the position in order to avoid the creation of weaknesses in his camp. However, when they reached a 7v7 pawns endgame, it turned out that Grischuk was not as careful as he should have been, and black got a winning position. Grischuk resigned on move 41. Vassily Ivanchuk continued his trend of playing dubious openings in this huge tournament; on this occasion, he chose the Budapest Gambit against Levon Aronian. The Armenian, probably highly surprised, played safely and maintained the positional advantage that white keeps in these positions. Ivanchuk quickly started to spend a massive amount of time to take rather logical decisions. Eventually, he had just over 1 minute to make 12 moves. Naturally, this led to a huge blunder on move 29. With this victory, Aronian maintains very realistic hopes of winning the event. 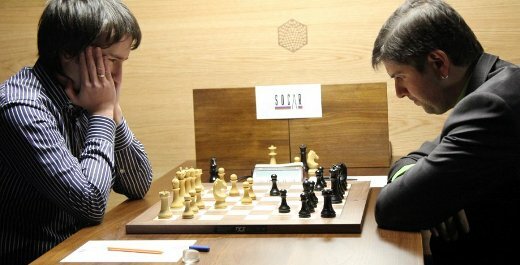 The shortest game of the tournament was seen today between Peter Svidler and Teimour Radjabov. The players started to make a triple repetition on move 21. This is understandable, given that both of them suffered painful losses in the previous rounds. Svidler played his favorite Gruenfeld and Radjabov chose the 8.Rb1 system. The Azerbaijani gave up his a-pawn on move 11, and the players developed their pieces naturally for a while. Radjabov started chasing the black queen on the corner to sign the peace treaty three moves later. There are only four rounds to go and the battle for first place is heating up. Tomorrow’s round will see the following games: Grischuk – Carlsen, Kramnik – Radjabov, Svidler – Aronian and Ivanchuk – Gelfand.